LED technology has greatly changed the face of the lighting market: In just a few years, lighting systems have become twice as efficient and half as expensive. These changes have resulted in a large but often untapped cost- and energy-saving potential in commercial buildings. 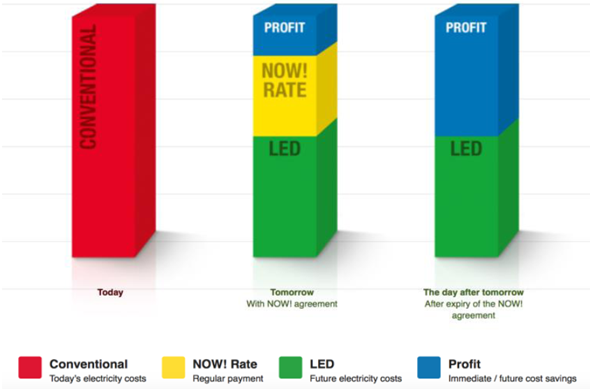 The research in Task 50 of the IEA Solar Heating and Cooling programme,Advanced Lighting Solutions for Retrofitting Buildings, has shown that the lighting industry is increasingly exploring opportunities for the use of contracting instead of leasing solutions to convince customers of retrofits. According to Marc Fontoynont, Professor at the Department of Energy Performance at Aalborg University, Denmark, and subtask leader ofMarket and Policies, there is a growing number of specialised companies which offer contracting models for lighting solutions, such as Austrian manufacturer Zumtobel has done with its contracting plan Now! (see chart). All in all, these contracting solutions are less complex than the ones for heat. A leasing agreement is very similar in structure to a rental contract. The owner of the building receives lighting equipment from a specialist and pays regular instalments over a certain period of time, usually five to eight years. Maintenance and some of the repairs will be taken over by a technician contracted through the owner of the building. The advantages for building owners are obvious: They don’t need to invest and profit from the technical expertise of the leasing company when using the most cost-effective solutions. Designers of retrofit lighting systems have to consider many factors, as lighting design remains a complex task. There simply has not been any standardised lighting system which would allow someone to replace it with a solution identical in power output, distribution and colour. However, the lighting industry intends to offer more than just leasing contracts. “The leasing companies specialised in lighting solutions see a certain risk in long-term contracts, unless the equipment is properly maintained. So they intend to offer their clients operation and maintenance services as well,” was how Fontoynont explained the trend in the market. These kinds of contracting solutions also increase the monthly amount of instalments and can raise the margin of the contractor. For example, German company Deutsche Lichtmiete advertises their services by saying “we rent light” instead of renting equipment, as a leasing company would do. “To rent light means that as a contractor, we offer our customers the entire package, including financing, maintenance and operation of the lighting system,” Christian Haferkamp, Head of Sales at Deutsche Lichtmiete, confirmed. This model means that the rental company bears most of the risk associated with product choice, quality and solvency of the supplier. Consequently, the client has only one contract partner – as opposed to leasing, which usually creates a triangle partnership between a bank, an equipment manufacturer and a customer. Contracting for lighting solutions was less complex than for heat systems, Haferkamp confirmed. “We use high-quality lighting systems which have an economic life of ten years, so that there is little maintenance to be done during the contract period,” the sales manager explained. Deutsche Lichtmiete specialises in bespoke, energy-efficient lighting systems for customers from all across Europe. It collaborates with various suppliers to reduce electricity bills by 55 to 65 %. After paying the monthly instalment, the customer benefits from a 15 to 25 % reduction in power costs, plus the saving in maintenance. Austrian lighting manufacturer Zumtobel Group calls its contracting service for lighting systems “Now!” Herwig Burtscher, Director Business Development at Zumtobel, explained: “We offer an all-inclusive package, supplying the customer with a certain level of illumination (lux) in industrial buildings and offices.” As with Lichtmiete, there are energy cost savings starting on the very first day of the contract. The chart above illustrates what amount of saving a customer can expect when purchasing the equipment after the contract has ended. But this is only one of the options offered by Zumtobel: “The customer can choose whether to purchase and continue operation of the equipment or decide on renewing the Now! contract. The latter means continued lighting services with new and more efficient equipment, e.g., sensors, WLAN connection, light controls, etc.,” Burtscher explained. “It is interesting to note that contracting creates a new type of competition. Manufacturers, installers, utilities and facility managers are entering into the market, putting great pressure on product costs. But fortunately, they also compete for reliability and quality,” was how Fontoynont summed up the lessons learned from the Task 50 market analysis. One example in this regard was France, where facility managers had become biggest players in the retrofit lighting business, Fontoynont said.